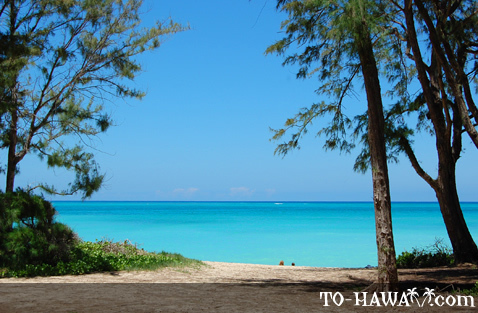 What do you call 3 miles of sloping white sand, hundreds of towering ironwood trees and a boundless turquoise sea? For visitors, this is paradise. 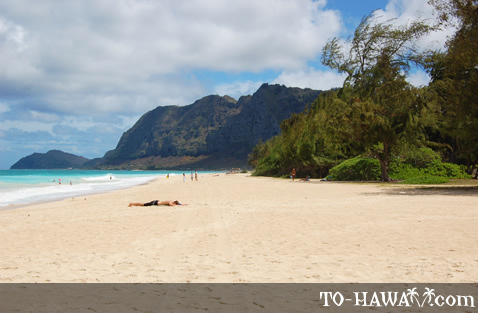 But for the locals of windward Oahu it is Waimanalo Beach (see more photos, view panorama). 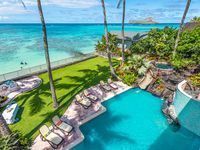 Located about a 45-minute drive from famous Waikiki Beach, Waimanalo is the kind of place that makes you blink to make sure you're not dreaming. 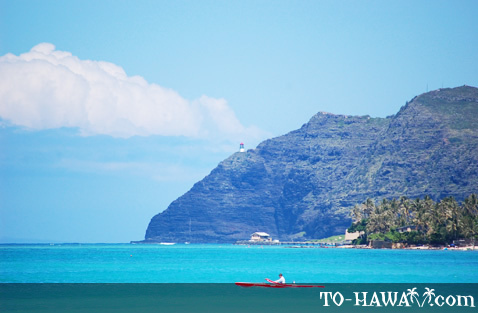 The main attraction here is the ocean, which looks azure blue even on a cloudy day. 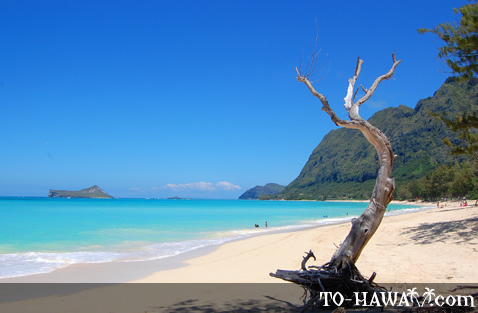 At around 3 miles (4.8 km) long, Waimanalo Bay is lined by the longest uninterrupted white-sand beach on Oahu. It's the perfect place for the ultimate beach stroll. 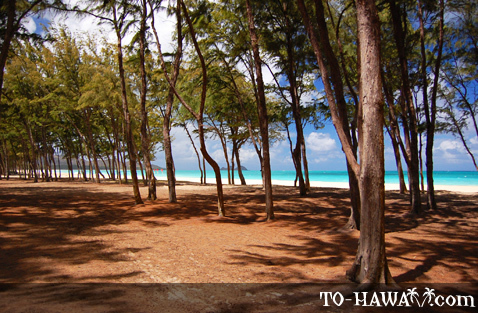 Much of Waimanalo Beach is backed by ironwood trees, which provide plenty of shade. There are two main access points to the beach (two beach parks), one near the southern end of the beach and one near the northern end. 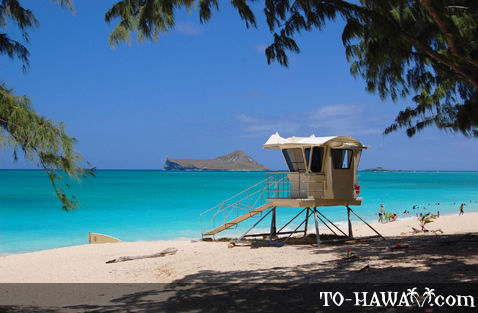 The southern one is called Waimanalo Beach Park, located across from Nakini Street. 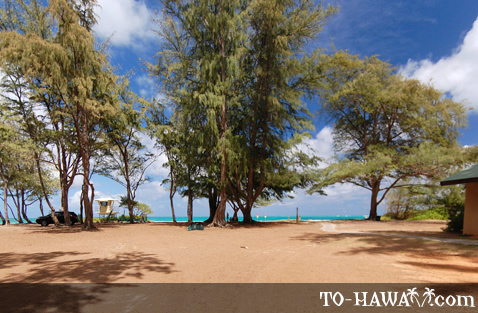 This beach park has showers, restrooms, a pavilion, picnic tables and a lifeguard tower. 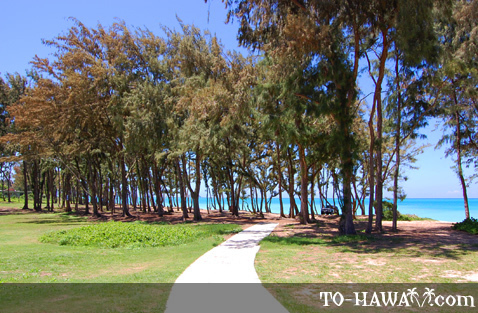 The northern access (between Aloiloi Street and Tinker Road) leads through an ironwood forest to the Waimanalo Bay State Recreation Area. 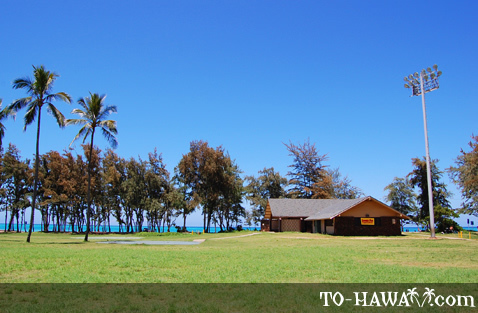 It has the same facilities and a lifeguard tower, plus a camping area where camping is allowed with a permit (more info on how to get a permit is here). 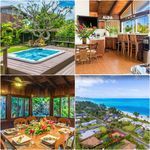 Since Waimanalo Beach is located on Windward Oahu, it faces the prevailing northeasterly trade winds, which can be quite breezy. If you plan a picnic here in the winter months (November to March), you may want to bring a light jacket as it can get a bit chilly, especially if it's windy. 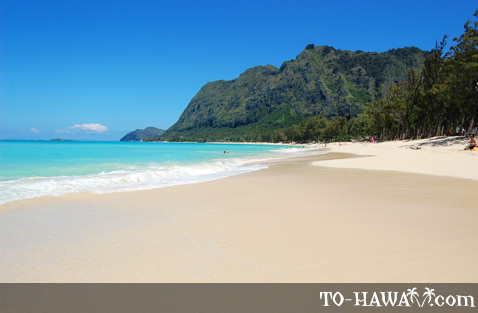 Waimanalo Beach is known for being a good bodyboarding beach since the waves are not too high and break close to shore. Occasionally the shorebreak is very powerful here, so be cautious when entering the ocean and stick to the areas where the lifeguards are located. 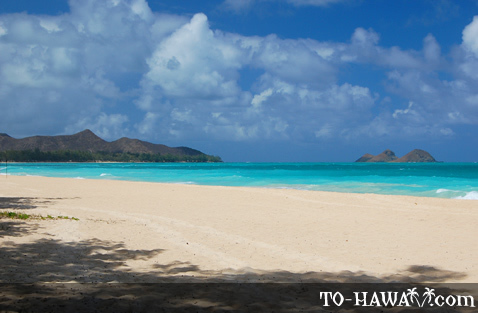 Did you know that Waimanalo Beach was the filming location for Magnum P.I. and Baywatch Hawaii? 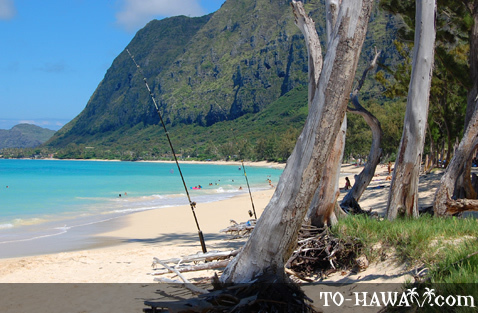 And even famous author James Michener wrote his novel Hawaii in Waimanalo. 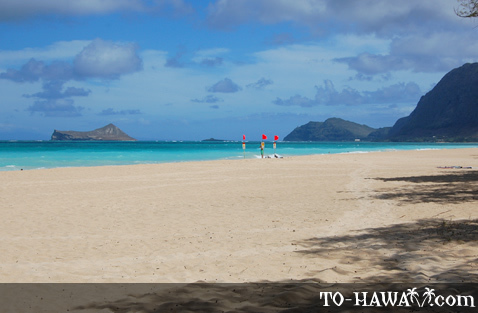 Also, Waimanalo Beach is a favorite place for couples who just got married to have their pictures taken. 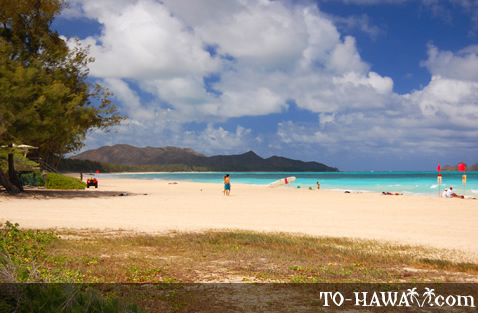 Waimanalo Beach is a silent refuge on most weekdays when you can have a good stretch of the beach to yourself. But on weekends, the grills and picnic tables get a serious workout. 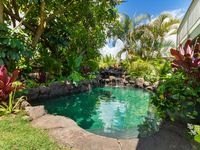 Locals gather for all-day barbecues and visitors come to sunbathe, swim and have fun. this year it was also paradise for us, but this year (feb1st to march 25) we try 4 times a week and each time there was a DOG running around us and others directly on the beach, and one time this same dog (look like pitbull) run direct on me I had to protect myself with my beach chair . And this same dog disturb a lot of people. And a lot of people living outside (sdf) why is Hawaii doesn't have more security ??? 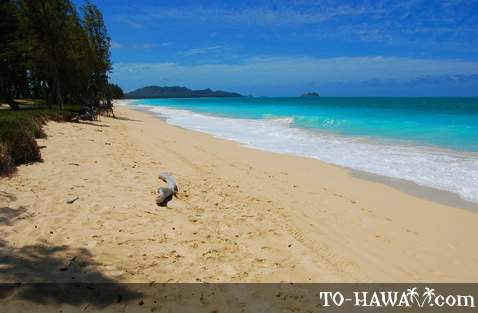 My absolute favorite beach on Oahu, loved to come back! Got married there. Loved it so much we took our kids back to show them and they both say it is their favorite place in the world and one of the best memories of our trip they have. We got married there. Love it! 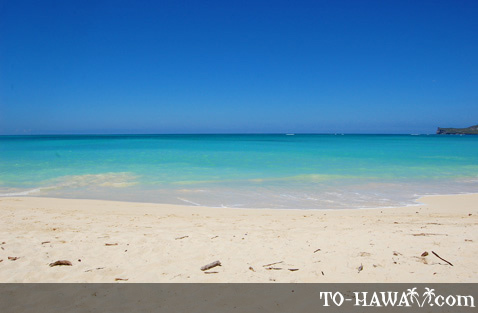 My favorite beach on Oahu! 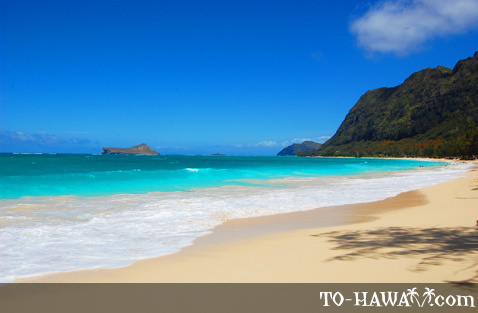 Having visited Oahu over 10 times in the past 30 years, I dare to say I know the island's beaches and Waimanalo Beach is truly my favorite. The water is so azure blue, even on a cloudy day. The views from here are amazing and the park has many trees along the beach and is far from the road, so you don't hear the traffic noise. 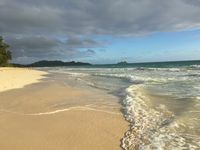 Waimanalo Beach is amazing. The water is so clear and the color of the ocean is azur blue. I enjoyed my ocean swim here. However, when I was waiting for the bus back to Waikiki, I sat down in the grass in the park next to the beach. I saw some small red-orange ants and a moment later, I noticed that I got bitten. It didn't hurt much at first, but later the area on my leg where the ants bit me got swollen and it was still hurting the next few days. So watch out for these ants if you decide to picnic in the grassy area of Waimanalo Beach Park. 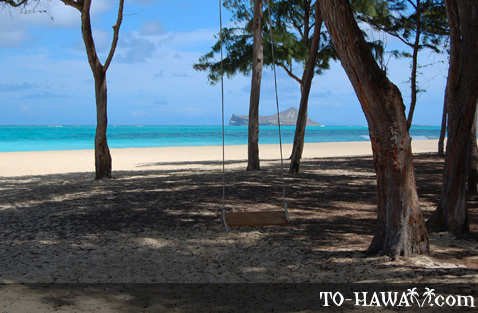 I have great memories from Waimanalo Beach. I wish I was back there.